Durga Puja festival has always been a great source of inspiration to me as a cartoonist. I have drawn several cartoons related to this festival and the way we celebrate it in our adopted homeland. Last week I posted one on the “Chanda” issue. This cartoon (drawn a long time ago for Kallol Sahityo Patrika) also takes a spin on the same touchy subject. In earlier times (late 80’s and early 90’s), the Pujo organizers did not specify or “suggest” any contribution amount to the attendees. The strong “suggestion” became, sort of, necessary from the later half of the 90’s when goat meat (or mutton curry) became a must item at the Saturday evening community dinner. Goat meat has always been an expensive item, and with the unpredictable attendance being a major problem, estimating the amount of meat to be cooked is always an issue. The volunteers serving dinner had to deploy smart strategies to control the number of mutton pieces to the hungry devotees standing in the line. At the beginning phase, they are generally generous, especially to their friends and families. 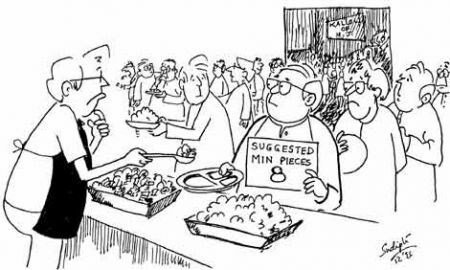 However, soon (after a quick review by the supervisors) the strategy changes to a rationing mode when the number of mutton pieces served becomes indirectly proportional to the number of attendees. Now in this situation, the tired and hungry attendee, who has paid the “suggested minimum contribution” has all the right to demand a “suggested minimum number of pieces” of the precious goat meat. After all, that was one of the key factors that attracted him to this festival in the first place! This entry was posted in Arts-Culture, Cartoons, Generic, Social and tagged chaanda, dinner, Durga Puja, festival, goat by sudipta. Bookmark the permalink.